1Typically defended in Georgia, the title was won after the Georgia Championship Wrestling was purchased by the then World Wrestling Federation. 2Not to be confused with the Vancouver, British Columbia based promotion that existed from the early '60s to the late '80s. This North Carolina promotion lasted from March 1998 until January 1999. 3The last TV title he won on January 12, 1979 was renamed to Heavyweight title on February 1979. 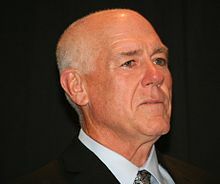 ↑ 1.00 1.01 1.02 1.03 1.04 1.05 1.06 1.07 1.08 1.09 1.10 1.11 1.12 1.13 1.14 1.15 1.16 "Tully Blanchard". Online World of Wrestling. ↑ 2.0 2.1 "Tully Blanchard". WWE.com. WWE. สืบค้นเมื่อ December 9, 2015. หน้านี้แก้ไขล่าสุดเมื่อวันที่ 16 ตุลาคม 2559 เวลา 19:03 น.